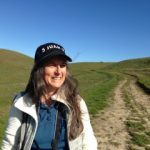 Where can you find wildlife in the East Bay? 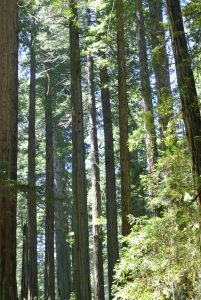 In the redwoods. That’s what kids do. This past summer hundreds of children enjoyed Touch the Earth camp inside Redwood Glen located in Joaquin Miller Park. By tuning in to the natural world they found not only the beauty and peace a forest offers, they also discovered unexpected historic objects and of course various wild creatures. Like a pair of peregrines nesting in the redwood canopy about 60 feet above our lunch spot. We could see their nest and two fledglings appeared a few weeks into the season. Later we saw the young ones learning to fly. Then they completely fledged and left the area. Throughout the summer though, we frequently spotted one of the adults. We speculated that it was a peregrine that had killed a barn owl nearby. A camper found the carcass in the middle of a fairy ring (a circle of redwoods that germinates from the roots of a larger redwood). The head of the owl was bashed into its shoulders so deeply that we imagined the raptor had landed hard on top of it. While owls don’t have necks to speak of, this victim didn’t even appear to have shoulders. The missing fleshy parts of the owl had probably been eaten by the bird. The owl remains included only its legs and talons and the lovely soft feathers of one wing, tawny and snow white with spots of color dotting what remained of the body. As for mammals, Coach Archie (one of the counselors) and I could not figure out why a dead squirrel he found one day had died. It was in good condition with soft grey fur all over. We thought it was about three to four weeks old. We didn’t see a nest nearby from which it could have fallen (if it was a tree squirrel) nor did we find any underground holes. We guessed that as close as it was to the broken bathrooms it could have been poisoned by sewage. 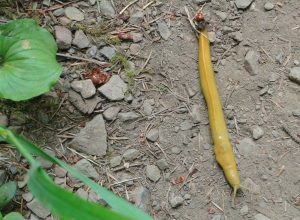 On foggier days, the kids oohed and aahed when the squishy banana slugs showed up. The mollusks absolutely love this moist habitat filled with delicious organic matter. In addition to the wildlife, one child found an arrowhead; another found an ancient rusty disintegrating ax without a handle. We weren’t surprised by this discovery because the kids were playing precisely in an area where a huge old growth redwood had been cut down and was even memorialized with a plaque. While they employed rather large tools to fell trees as wide as 31 feet back in the nineteenth century, axes were likely used to initiate tree cuts. When we walked to the horse arena one day, the campers started playing games. I was at one end and heard a loud cry from a bunch of kids at the other end. “Leanne, come here, we found a dead snake!” It was music to my ears. I ran over to see a 20-inch garter snake, which may have been stepped on by a horse since its organs were coming out the tail. Or maybe a hawk had caught it and then dropped it from high in the sky. After studying it for a bit, we left it for the scavengers that live in Joaquin Miller Park — turkey vultures, coyotes, skunks and raccoons. In fact, two days later, when we returned, only the head remained, a living example of how successfully nature recycles. For more information on the City of Oakland’s summer camps, email oaklandnature@gmail.com or call 510-238-3739.